Meet Sam, the enforcer of the rules of Halloween. Straight from the cult status film Trick 'r Treat. Sam's film-accurate hood mask is removable! 15-inch doll includes his infamous sack and deadly lollipop. Straight from the cult status film Trick 'r Treat, comes Sam, the enforcer of the rules of Halloween. Part pumpkin, part supernatural being, he shows no mercy to those who disrespect his holiday. 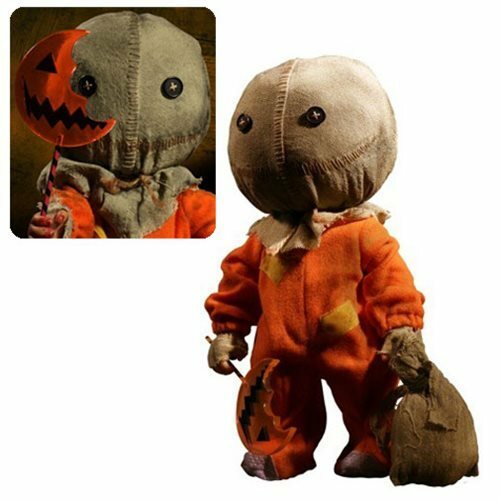 Standing an impressive 15-inches tall, the Trick 'r Treat Sam Mega-Scale 15-Inch Doll comes in his tattered orange footie pajamas, with his infamous sack and deadly oversized translucent lollipop. Remove his film-accurate hood mask to behold his twisted demonic visage! Featuring over 9 points of articulation, Sam comes packaged in a specially die-cut window box that's perfect for display. Ages 15 and up.